Rainbows + butterflies! Katy Perry wears a custom Valentino Haute Couture dress and cape on her ‘Prismatic World Tour 2014’ in Belfast, Ireland on May 7, 2014. The dress is a tulle gown with butterfly wing inserts on the bodice and flying butterflies on the skirt. 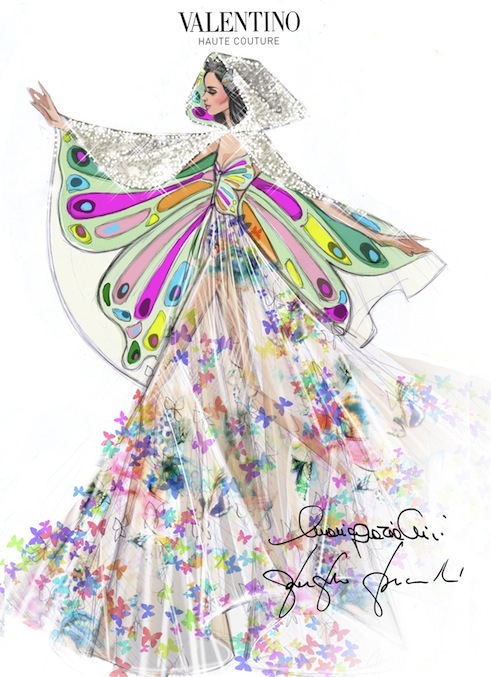 The cape is embroidered with nacre micro sequins and lined with a multicolor organza butterfly. Katy will be wearing this look throughout her entire tour. Check out the details and the sketch. love, love. Check out the sketch. more from Katy Perry , Valentino Haute Couture on tour.